edging out Acura and Hyundai, which rank No. 2 and No. 3 respectively. Mazda, which ranked second last year, is now the brand with the lowest average repair cost ($286), followed by Kia ($320), Dodge ($326) and Hyundai ($328). Honda and Toyota are the only two brands to rank in the top 10 on both lists. The 2016 Audi Q5 is least likely to need a check engine light-related repair. The 2017 Hyundai Tucson costs the least on average ($67) to repair when the light is on, with a loose gas cap or an improperly installed intake air duct the two most common reasons the Tucson’s check engine light illuminates. CarMD.com Corp. has released its 2018 CarMD Vehicle Health Index Make and Model Reliability Rankings.. Published annually since 2011, this Index analyzes check engine repairs and costs to rank the 10 brands and 100 vehicles least likely to have a check engine light on; 10 makes and 100 vehicles with the lowest average repair costs; and top three vehicles by category. CarMD analyzed data from over 5.6 million in-use vehicles, model year 1996 to 2018, reporting check engine health from Oct. 1, 2017 – Sept. 30, 2018. At least 10% of the cars and trucks on the road in the U.S. have a check engine light on at any given time, and a pilot test of the new CarMD Pro Scan repair shop solution found that as many as 25% of vehicles brought to the repair shop have a check engine light on. Because it is likely that every vehicle owner will eventually have to address a check engine light, CarMD studied data from more than 5.6 million vehicles from many sources to help identify the makes least likely to need check engine repairs. To rank these makes, CarMD developed a formula that accounts for those with the lowest percentage of repair incidents per percentage of vehicle population. Based on this data, an Index frequency score is assigned. The lower the score the higher the vehicle make ranking. 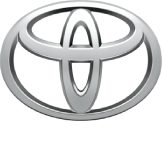 CarMD found that over the past year, Toyota ranked no. 1 as the brand least likelyto have a check engine light on. Toyota is followed by Acura (no. 2) and Hyundai (no. 3). The 2016 Audi Q5 is the vehicle least likely to have a check engine light on among the 9,130 different model year 1996 to 2018 vehicles analyzed by CarMD in 2018. The vehicle brand with the lowest average repair cost for CHECK ENGINE problems in 2018? Mazda, which had an average recommended parts & labor estimate of $286. At least 10 percent of the cars and trucks on the road in the U.S. have a check engine light on at any given time, and a pilot test of the new CarMD® PRO SCANTM repair shop solution found that as many as 25 percent of vehicles brought to the repair shop have a check engine light on. Because it is likely that every vehicle owner will eventually have to address a check engine light, CarMD studied data from more than 5.6 million vehicles from many sources to help identify the makes least likely to need check engine repairs. CarMD found that over the past year when it comes to repair frequency Toyota ranks no. 1, with a 0.58 CarMD Index frequency score. Toyota is followed by Acura, which ranks no. 2 on the list – down from its top ranking last year. Hyundai ranks no. 3 this year. Rounding out the top five brands least likely to need check engine light repairs are Honda and Mitsubishi. Any given brand can have a mix of reliable vehicles along with some that have more frequent issues. For this reason, the CarMD Vehicle Health Index drills down to rank vehicles by year, make and model. The most common and affordable repair on 9 out of 10 of the most affordable vehicles is to inspect or replace a loose, damaged or missing gas cap. The exception is the 2017 Mitsubishi Mirage that is most frequently diagnosed with a faulty or incorrectly installed vacuum hose, which is also one of the most common and affordable repairs. Those whose vehicles have a high percentage of finicky gas caps often have lower average repair costs, but still waste time getting it diagnosed. 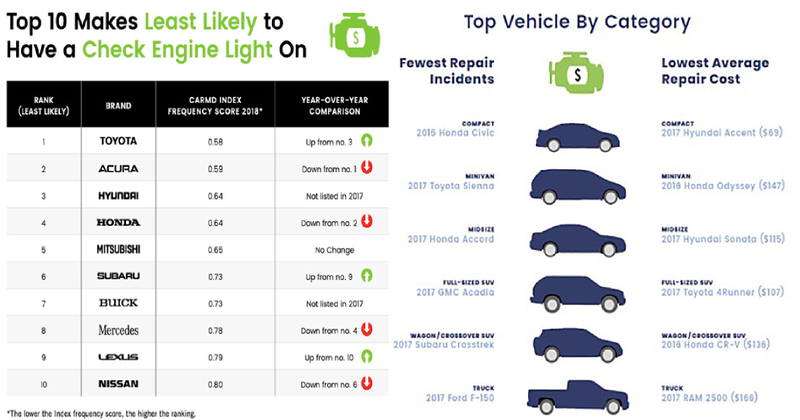 Details on the most common repair for each of these vehicles as well as the best vehicles in each category, and vehicles with the most frequent/most expensive repairs are available in the full 2018 report. Headquartered in Irvine, Calif., CarMD.com Corp. is a leading provider of automotive diagnostic business solutions, digital automotive aftermarket platform services and vehicle data licensing. CarMD specializes in automotive technology solutions that leverage and empower the capabilities of the on-board diagnostics (OBD) port. Published tri-annually, the CarMD Vehicle Health Index reports on automotive repair and maintenance trends. For more information about CarMD’s automotive aftermarket solutions, including current and archived Vehicle Health Index reports, visit www.carmd.com. Twitter, Facebook, Google+, Linkedin. Shop and Detailing – Sales Professional Contact! 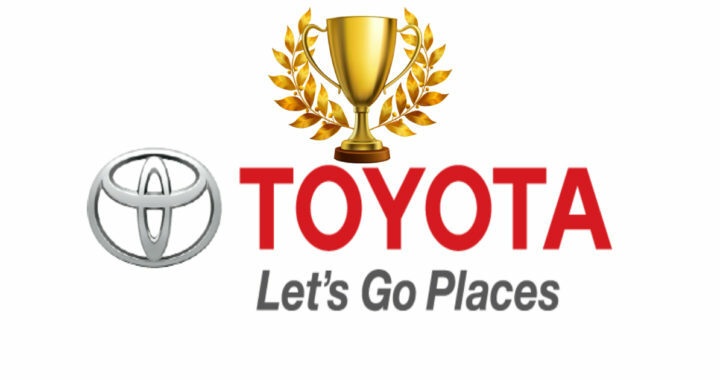 Posted in News and tagged 10 Brands with the Lowest Average Repair Costs, 10 Most Reliable Brands, 10 Most Reliable Vehicles, 10 Vehicles with the Lowest Average Repair Costs, 2018 Automobiles Reliability Rankings, Toyota the brand least likely to need check engine repairs, Vehicle Health Index Make and Model Reliability Rankings.